"Gigant Extractor table and fume-cupboard." A great deal of work involves exposure to injurious substances: grinding, welding, soldering, mixing of paint and adhesive, handling of thermosetting plastics and PUR, etc. Grinding dust, fumes, vapours are taken care of by the extractor table or fume-cupboard. 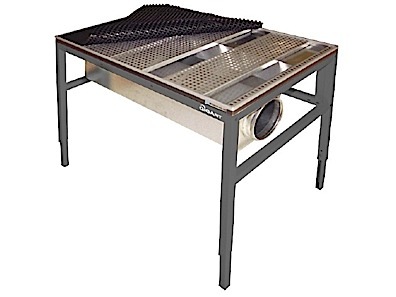 The extractor table features extraction through a grille equipped bench ideal for e.g. grinding. Effective collection of particles in a bag below the table. The extractor table is available with two different table frames. The tables can be supplemented with several add-on options from the range. 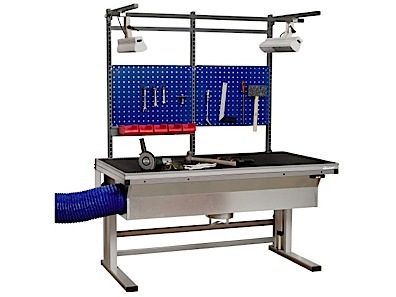 Gigant Flex 375, Extractor table. A very stable motorised two-leg stand made of anodised aluminium. Adjustable height 725-1175 mm. Max load 300 kg distributed weight. The table is equipped with double motors and is connected to 230V/50Hz. Supplied with a table top of perforated rubber that spares the surfaces of the work piece. Other table materials can be quoted on request. The table can be supplemented with a filter. Manually adjusted table; height adjustment 740-990 mm. Max. load 300 kg distributed weight. Supplied with a table top of perforated rubber that spares the surfaces of the work piece. Other table materials can be quoted on request. The table can be supplemented with a filter. 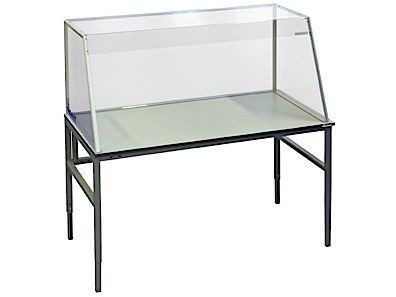 The fume cupboard is ideal for soldering and mixing paint. The cupboard can be placed on an existing table or placed on an extractor table. When the fume cupboard is placed on an extractor table you produce a flexible solution for both grinding and welding. Manufactured of impact resistant polycarbonate, which is far more resistant than Plexiglas. The fully transparent hood makes the workplace open and light. 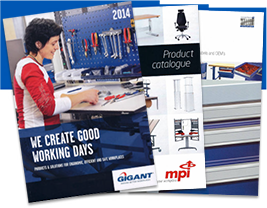 Available in several standard widths up to 2000, but can also be made in special widths.